I keep telling people, myself included, that I’m not a fan of musicals, I prefer a good ole fashioned play…and then I list some notable exceptions; The King & I, Cats, Showboat, Phantom of the Opera, Carousel, The Rocky Horror Show! I then realise that I do like musicals, I just don’t like the modern trend of taking some famous songs and then bunging them on stage with a thinly veiled storyline tying them all together. 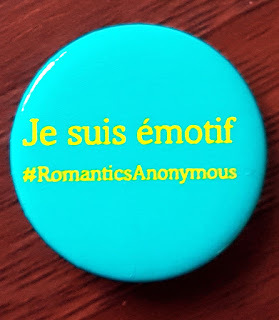 So when I was asked if I wanted a ticket to see Romantics Anonymous, I was a bit, well, meh! I didn’t know much about it, but I still said yes to a ticket! Press reports show the public has had a love hate relationship with Emma Rice since she was appointed Artistic Director at Shakespeare’s Globe. I’ve seen a few plays at the Sam Wanamaker whilst she has been in situ, and I have enjoyed them all, but reports on how some of Shakespeare’s most loved plays have been toyed with at The Globe have left me relieved that I’ve not borne witness to them. I found it interesting that she had chosen a musical as her final production for Shakespeare’s Globe, but then I realised it would be the first musical to be presented in the Playhouse; and that it is rather in keeping with a lady who has shook up the establishment at The Globe. It’s a loud and proud goodbye with head held high; she is not shying away into the night. As I took my seat, a lady dressed like a French mime artist was handing out chocolates. Do not eat in now, she said to me in French. Eat it when you’re told to in the play. “C'est magique!” I don’t know about magic, but my French is appalling, so it was amazing I could grasp what she was saying. I settled down for the start of the play…everyone on stage was speaking French. Oh dear Lord I thought, if I have to concentrate this hard for the entire play my head will explode. My prayers were answered, we were told to eat our chocolates (eating chocolate can be understood in any language) and by the power of chocolately magic I could suddenly understand everyone…it was as if they were suddenly speaking in my native tongue!! Shyness between would be lovers is a story as old as time, and shared by people across the globe. In the mid 1960’s a psychology professor, Dorothy Tennov, interviewed a number of people afflicted by overwhelming shyness when it came to affairs of the heart. She coined a new word, limerence, which she said produced “sometimes incapacitating but always unsettling shyness.” Symptom’s included heart palpitations, stammering, sweating and fainting, and our shrinking violets show on stage how debilitating shyness can be. When our hero and heroine finally go on a dinner date we’re a mixture of emotions watching them; Angélique (Carly Bawden) has crib cards with varying topics of conversation, whilst Jean-René (Dominic Marsh) has come prepared with a number of garish shirts to change into as each one gets soaked with his nervous sweat! We cringe and laugh with them as they try to do their best in what for them is a stultifying experience. Whilst the whole of the cast is brilliant, a stand out performance is given by the multitasking Joanna Riding (Stella, Holby City, Heartbeat) she starts off playing an officious overseer in the factory, (looking as though she belonged on the cobbled streets of Corrie) but then steals the show playing Angélique’s mother, complete with black bra and plenty of leopard print as she belts out words of advice to poor Angélique. But it’s when she takes to the wheel for the funniest car chase you’re ever likely to see staged that will leave you in stitches! 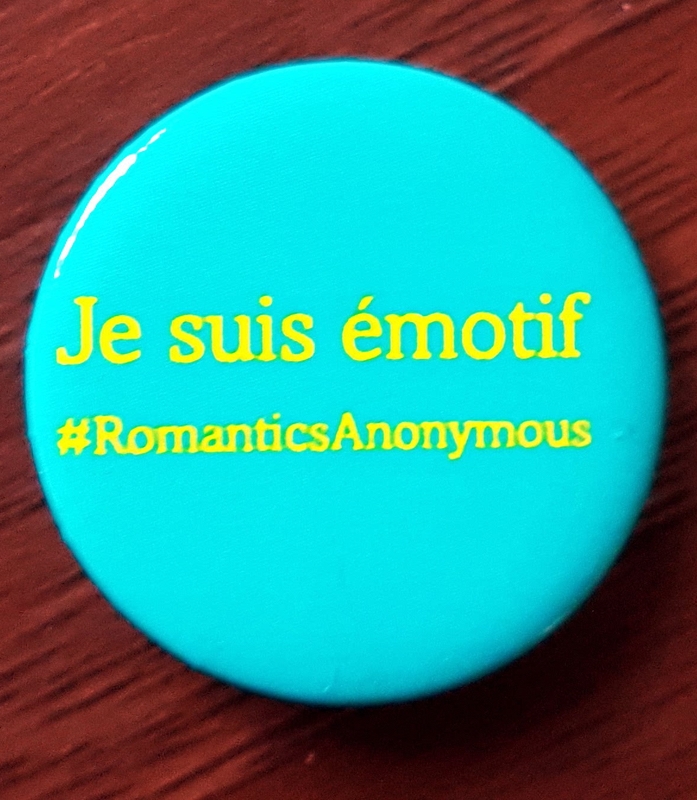 In an often depressing world, Romantics Anonymous lifts the lid on the encroaching gloom and transports the audience into a world of sweet, joyfulness. Emma Rice should be justifiably proud of her swansong; she is leaving the Globe on a theatrical high...rather like Jean-René and Angélique dancing on air in an impressive finale. 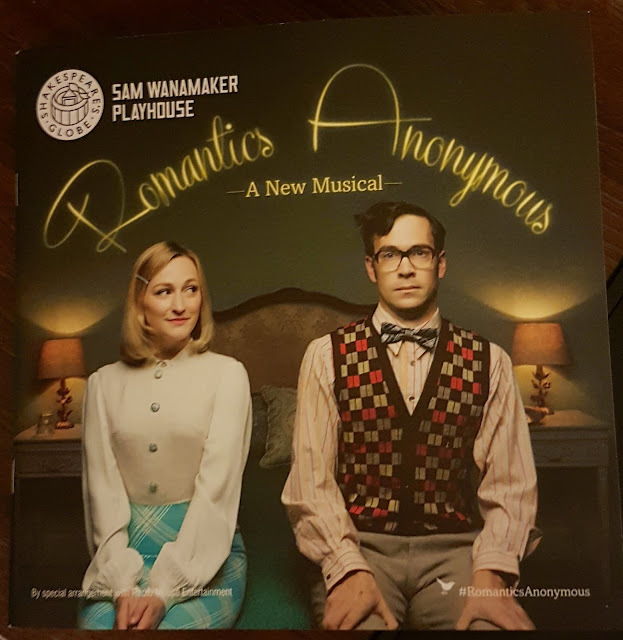 Romantics Anonymous is playing at The Sam Wanamaker Playhouse until 6th January 2018.